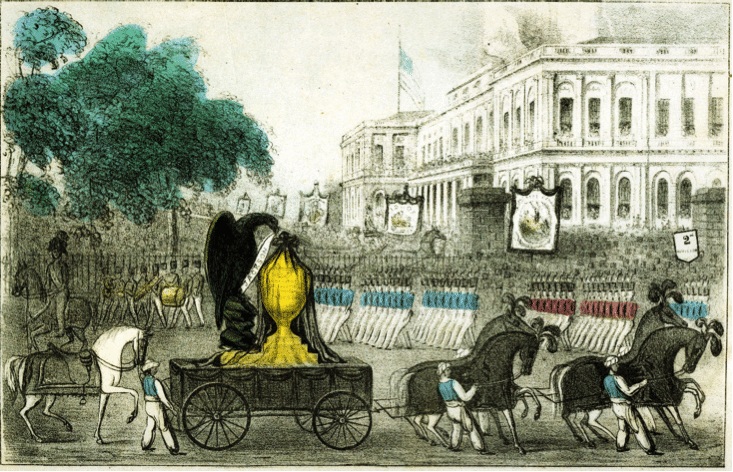 On June 8, 1845 America said farewell to one of the country’s most legendary figures, President Andrew Jackson. With nearly three thousand people in attendance, President Jackson was buried in the Hermitage garden next to his beloved wife beneath an ornate cupola in the family cemetery. 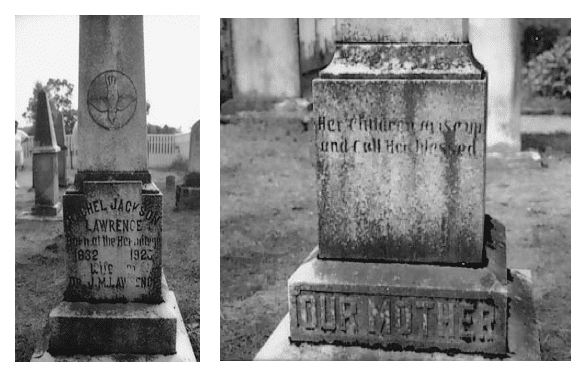 This cemetery continued to serve as the final resting place for members of the Jackson family until the 1970s. The elaborate design of the cemetery is an example of the common funerary customs of the 19th century. Coined after the death of her husband, Queen Victoria’s long period of mourning sparked the beginning of the Victorian era in which funerals became very public, grand affairs. The objects and photographs from the Hermitage collections and grounds illustrate this period in funeral traditions. 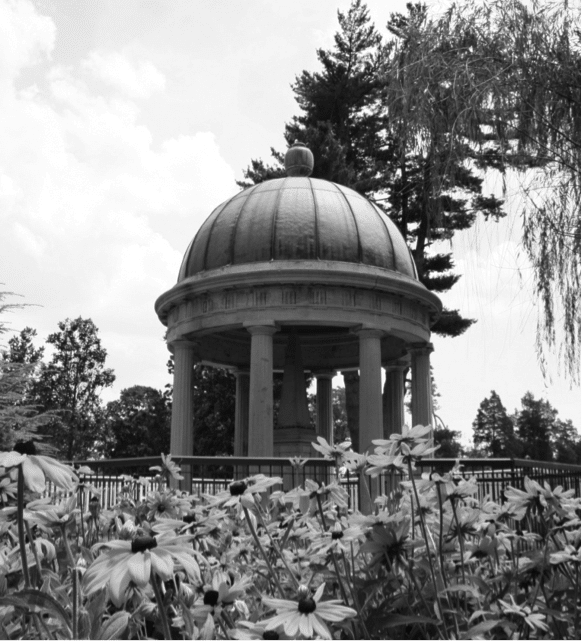 The cupola in the Hermitage garden which covers the tombs of President and Mrs. Jackson. During the Victorian era, tombstones significantly increased in size and were composed of more expensive materials. These new designs often incorporated Egyptian symbols and/or images of animals. More elaborate markers usually signified the graves of wealthier individuals; while those of lower classes would remain more modest in composition. A study of the generations of tombstones from the Hermitage cemetery provides examples of the variation in designs. A popular motif used during the Victorian period was the Egyptian obelisk. While the obelisk originated as a pagan symbol, it was later adopted by the Catholic Church in order to convert pagans to Christianity. The church added Christian symbols to the obelisk to aid in this conversion process. 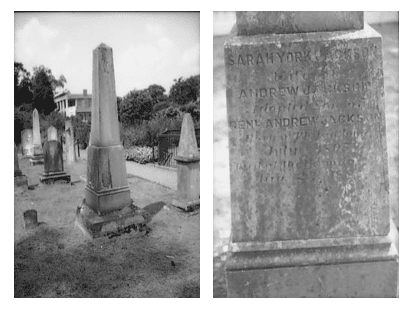 These obelisks in the Hermitage cemetery mark the graves of Andrew Jackson, Jr., his wife Sarah Yorke Jackson (above), and their daughter Rachel Jackson Lawrence (below). In addition to the customary birth and death dates along the base, religious poetry and Christian symbols have been added to recognize the individual’s faith. The descending dove signifies a spirit from above descending to Earth to guide the deceased’s spirit to Heaven. In addition to elaborately decorated tombstones, it was also customary for loved ones of the deceased to create various forms of memento mori, or objects of the dead. 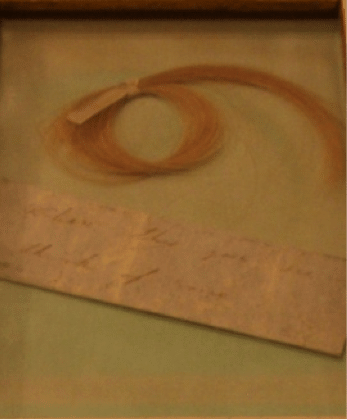 These objects ranged from paintings and photographs of the deceased or creating artwork and jewelry from a lock of the person’s hair. Print, Death of Gen. Andrew Jackson, 1845. After the passing of President Jackson, many artists created “death scene” pieces depicting Jackson on his deathbed surrounded by his loved ones. 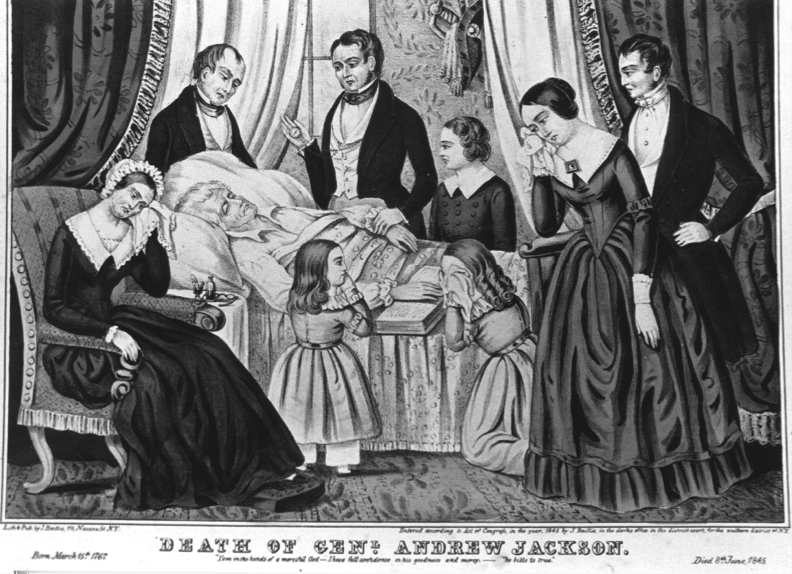 The death of Jackson was reverenced across the country in memorial services and parades. Note the pageantry of the event and the artist’s inclusion of common symbols of death including the black bird and black crepe cloth. The funeral of Alfred Jackson, given by the Ladies’ Hermitage Association, is the only known burial of a formally enslaved person at the Hermitage. 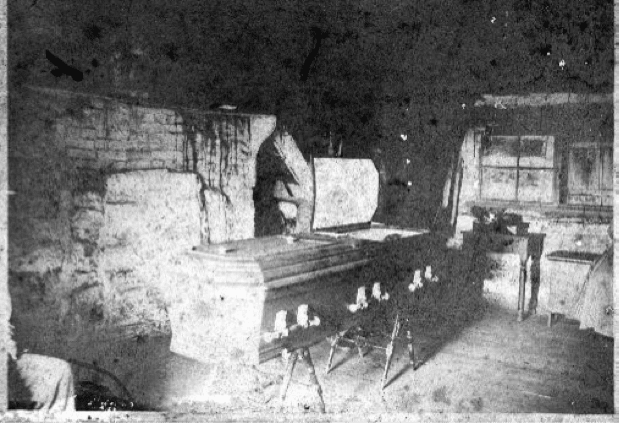 In accordance with Victorian customs, his body was photographed in his living quarters for viewing prior to his interment. The image above of Alfred’s casket proves to also be a vital piece of documentary history as formal funerals with ornate funerary objects was not common for individuals of lower classes during this period. By having the LHA host such a lavish funeral for Alfred illustrates his ability to cross class lines during his lifetime. Mourning clothing was the most commonly noted funerary custom of the era. Adults in mourning usually wore black and children were dressed in all white. 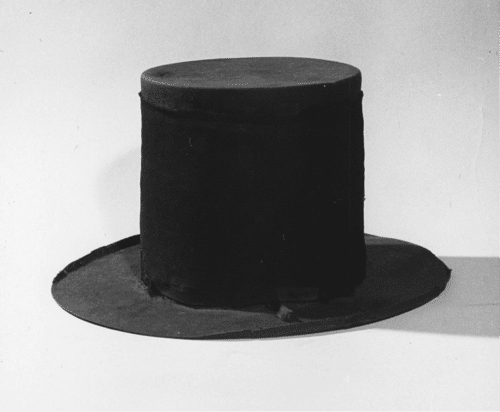 Jacket and dress collars were sometimes adorned with memento mori or black bands were worn around the forearm and/or around hat rims. Families would often have close relatives, usually the deceased’s spouse or children, photographed in their mourning attire. Augustus Bradley, son of Alfred Jackson, and his family on the day of Alfred’s funeral, 1901. The adults are wearing all black with the hair of Alfred’s granddaughter covered with a black veil. His great-granddaughter is wearing an all white dress with white hair ribbons. 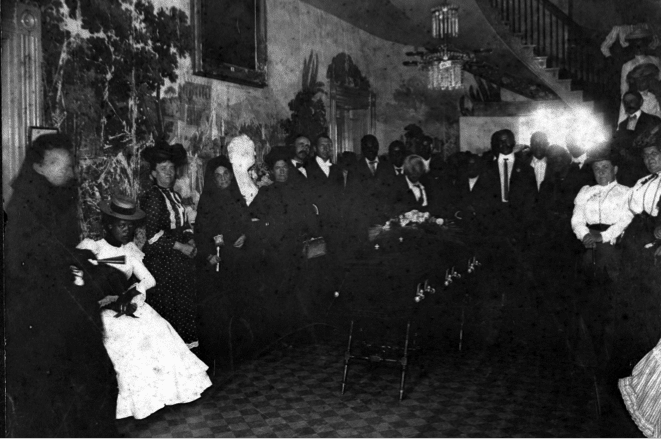 Alfred Jackson’s funeral in the main hall of the Hermitage mansion, 1901. 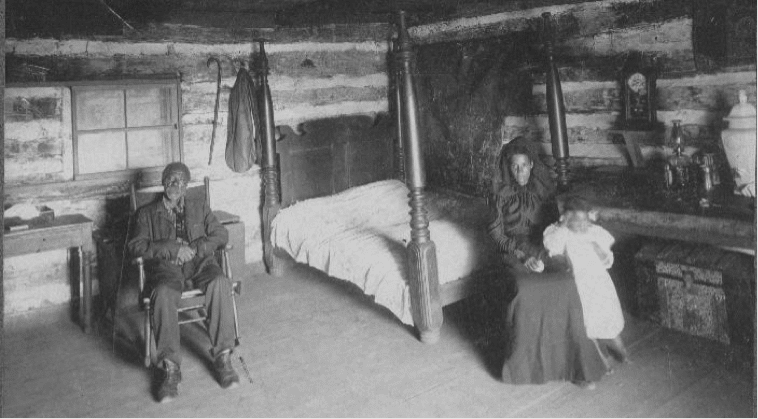 Note the variety of mourning clothing worn by both the men and women in the photograph. The death of Queen Victoria in the beginning of the 20th century brought an end to the Victorian period and many of these funerary customs. New technology and medical advancements allowed for individuals to live longer lives and less of an emphasis was placed on death. By the mid 1900s, funerals returned to being private, family occasions.